Custom Equipment features a wide variety of safety ladders. Featuring: Ballymore safety ladders, Cotterman safety ladders, Ballymore 50 degree ladder, Cotterman 50 degree ladder, Ballymore cantilever ladder, Ballymore aluminum ladder, Cotterman aluminum ladder, Ballymore stainless ladder, Ballymore mobile platform, Cotterman mobile platform, Ballymore fixed crossovers, Cotterman portable crossovers. Standard ladders have a Ladder Slope (approximately 59 degrees) and are designed for the user to face the steps when climbing and descending the ladder. 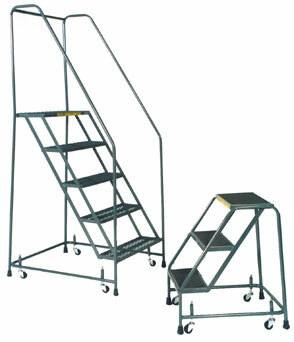 Stairway Slope ladders (approximately 50 degree slope) allow the user to face outward when descending the ladder. 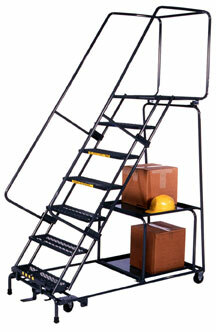 Stairway Slope ladders are particularly effective when carrying heavy or bulky items up or down the ladder. Stairway Slope ladders have a longer base than Standard Ladder Slope ladders. What are the major features and benefits of Steel, Aluminum, and Stainless Steel? Steel Ladders: For all around general purpose. Very rugged and economical. Aluminum Ladders: Non-magnetic and non-sparking. Paint-free for pharmaceutical & food applications. Aluminum mill finish with industrial grade welds. Also ideal for wash-down applications. Stainless Steel Ladders: Type 304 Stainless Steel construction. Ideal for wash-down and corrosive environments. Bead blasted finish. All stainless steel ladders are manufactured with industrial grade welds. Not recommended for Clean Room applications.